Perth Scotchers announced 13 men squad for the match with 2 changes. Michael Klinger and Nathan Coulter-Nile are back in the squad replacing Shaun Marsh and Usman Qadir. Melbourne Stars have declared 13-men squad for the match with 1 change. Jackson Coleman returns to the squad replacing Tom O'Connell. Glenn Maxwell (c), Dwayne Bravo, Ben Dunk, Evan Gulbis, J Bird, Marcus Stoinis, Adam Zampa, Seb Gotch, Peter Handscomb, Nic Maddinson, Dan Worrall, Tom O’Connell, Liam Plunkett. 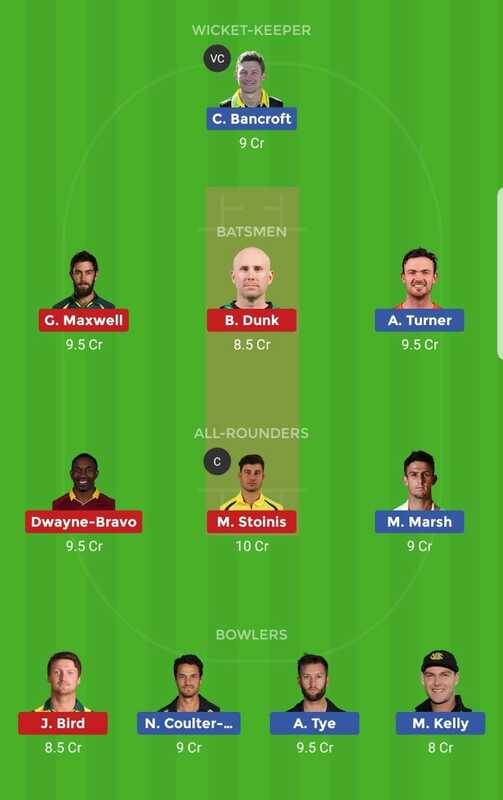 Other C & VC Options: Dwayne Bravo, G Maxwell, M Marsh.